If you manage dozens of employees on complex projects with interlocking deadlines, task delegations, and complex dependencies, Holly is not for you. 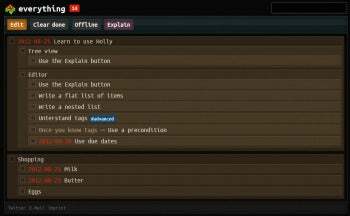 But if you are looking for a simple way to rein in your to-do list without downloading an application or opening an account, this simple and free Web app may be just the ticket: Holly is just one step above a simple todo.txt file. Holly's large typography and simple layout make it easy to use. To start using Holly, simply go to http://hollyapp.com and click the big "Start writing" button. You will instantly find yourself in a to-do list pre-populated with some simple items showing off Holly's features, such as deadlines, task tags, and nesting. Your list also will also get a unique URL which you can use to share the list with others, or to access it from other computers. This is similar to the obfuscated URL you get when sharing a Google Docs document–anyone with the URL can access the list, but the URL is practically impossible to guess. Clicking an individual item takes you into the editing screen, which looks like a simple text editor. There are no boxes to tick or drop-downs to pick from--your list is all text. 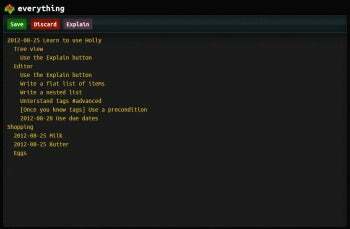 Holly detects a few special syntax structures, so you can set deadlines by prefacing your task description with a date, and categorize tasks using hashtags (#ProjectX). Not having to open an account before getting started is a great time saver. That said, it would be nice if accounts were at least an optional feature: This could pave the way for connecting Holly with Dropbox, and editing the lists as plain-text files in any editor. This is something you can already do with todo.txt, but that's a downloadable solution that requires a few setup steps before you can use it. Editing a to-do list in Holly is just like editing a text file. Another feature that's missing from Holly at the moment is item folding. Holly makes it easy to nest lists and list items, but offers no way to collapse your lists. On the plus side, Holly already features a few handy keyboard shortcuts, such as Alt+Shift+E for editing the list, and Alt+Shift+S for saving it. These make it possible to use Holly without ever reaching for the mouse, except for ticking tasks off as done. Holly doesn't try to do it all, and by offering a narrow, focused set of features, it comes off as a simple and elegant solution. It may not be the best choice for a NASA-scale project, but it's great for small projects and personal management. Create, manage, and share to-do lists with simple and beautiful Web app Holly.